This invitation arrived in my inbox a few weeks ago. 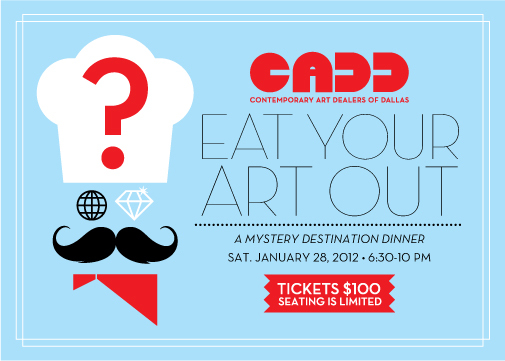 CADD, an association of 14 Contemporary Art Dealers in Dallas, was trying an experiment – a mystery destination dinner with the place revealed only after a reservation was made – as a way to raise funds for scholarships and educational programs. It intrigued me, but I was distracted by other requests, and responded “Yes” much later, only after a gentle nudge from my friend, Laura Green, Director at Valley House Gallery and Sculpture Garden. All over town the homes of Dallas art collectors, gallery owners and artists were open to us. We were assigned to one for the evening. My mystery destination was the home of art collector, Susan Reese – an excellent cook assisted by her daughter and son-in-law…who take family fly fishing trips where I can imagine, based on last night’s relaxed atmosphere, there is much lively conversation and a lot of laughter. The CADD co-host was Brian Gibb, owner of The Public Trust gallery in Deep Ellum. Yes, he still has his signature barbershop moustache and it suits him well. The night was different and much fun. We ended at the MAC/ McKinney Avenue Contemporary for dessert and dancing to the beat of Watson Electric, with CADD member and gallery owner Barry Whistler working the drums. 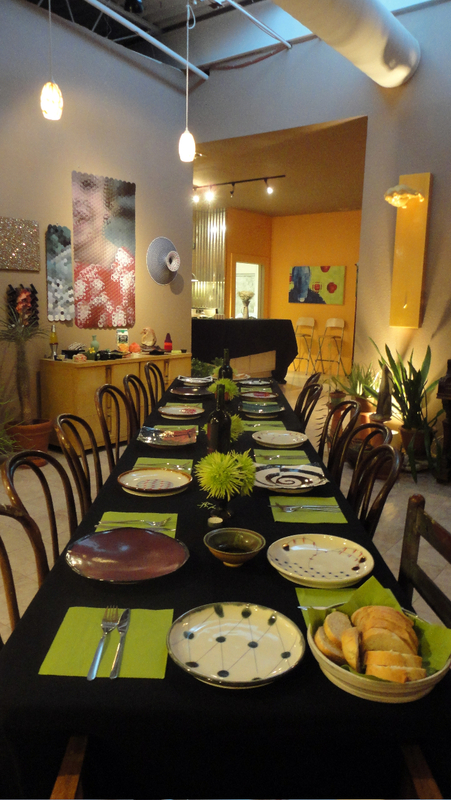 “Eat your Art out” was a sold out event. Next time, I will be among the first to reserve a place at the table – no hesitation on my end. A good friend of mine has made an excellent mark and reputation in the design world and hospitality industry. She’s someone who is productive and articulate about her work routines and creative process. The other day we were talking about a concept called “guilt-free play” which increases her productivity and makes life more enjoyable. It’s a simple tool. Work is followed/ rewarded by a planned activity that recharges her soul/ body. 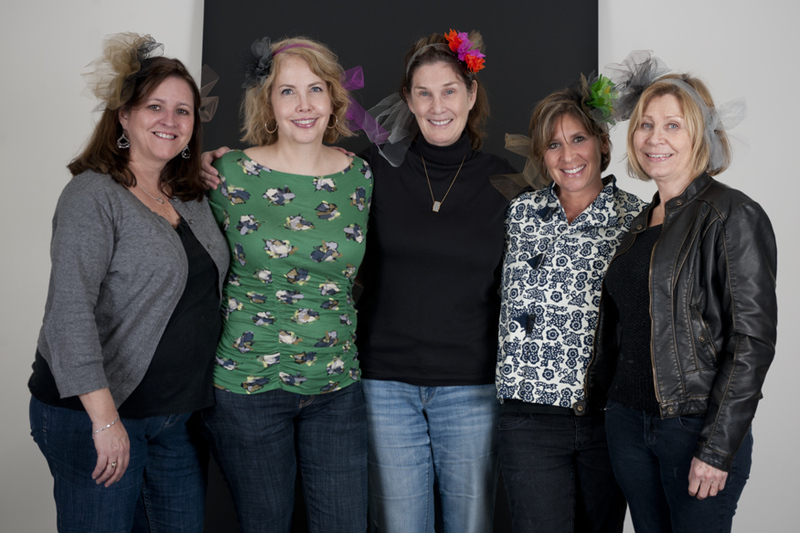 Last Friday night, my “guilt-free play” was a trip to the Dallas Arts District with a group of girlfriends, who are funny, after working on several projects in my studio. We had dinner at one of the food trucks – my favorite is the Green House Truck, and celebrated the Chinese New Year by watching the Crow Museum’s Dragon Parade. Then, there was an electric surprise at the Dallas Museum of Art. To celebrate the Jean Paul Gaultier exhibit, anyone could dress as one of his divas – Lady Gaga, Madonna – or use their own imagination. 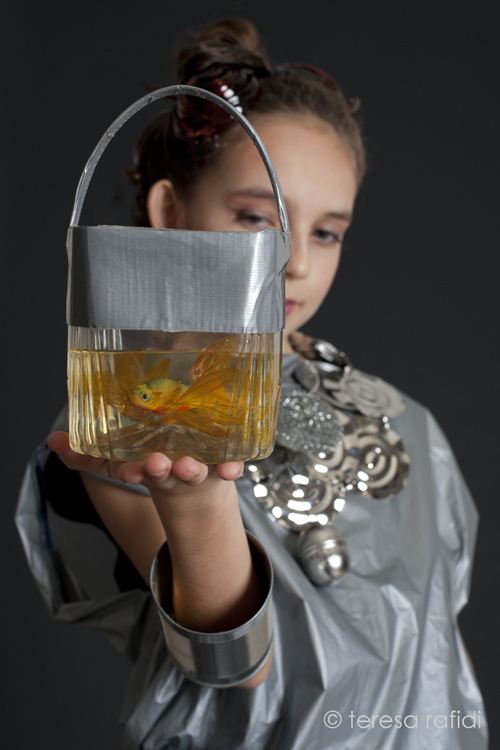 A 10-year old girl, who admires JPG and is Project Runway material, made this fish bowl purse. 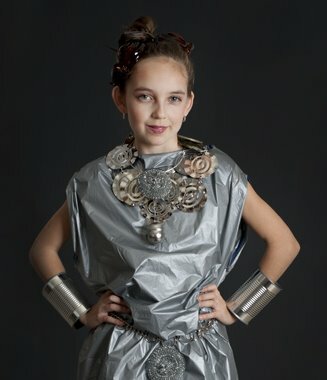 Her belt and necklace are stainless steel scouring pads and a tea strainer. I like this tool of “guilt-free play.” It made me more focused and productive in my studio during the day because I didn’t tell myself, “I’ll do this later tonight.” It also led to being totally engaged in the Arts District’s Late Night activities. Like me, maybe you have been driving West on I-30 from Dallas towards Fort Worth wondering about the bright blue tower and construction site at the Hampton Road exit. 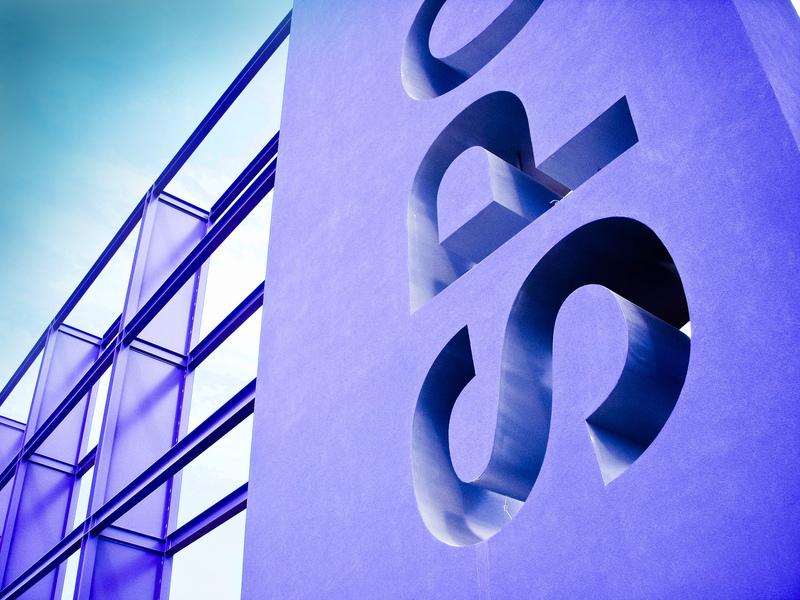 Here’s the scoop: This beauty is the new Dallas SPCA Animal Care and Adoption Center which houses the most adorable animals – dogs and cats of all ages, a bunny rabbit and several guinea pigs – in a spatial concept new and revolutionary to the world of public animal shelters. Gus Hinojosa, AIA, Managing Principal, and his team at Hinojosa Architects and Interiors (HAI) incorporated design ideas and research from the veterinarian and retail industries to improve the adoption experience and foster healthier animals. Functional and aesthetic details shaped all areas for the rescued animals, wellness and spay/neuter services, medical wing and surgery suite. Aren’t I cute puppy? I like my candy-colored dog bed. At last night’s reception, I experienced this concept with other admirers, and will be back to scout out the cats in their cool condos. I’m in the market for the right furball fit. When you visit, admire the modern design of the scratching posts, notice the signage graphics and sit on a banquette covered with fabrics by William Wegman, the artist best known for his Weimaraner photographs. Even in the world of non-profits, good causes and architectural design, there’s always a bottom-line consideration. 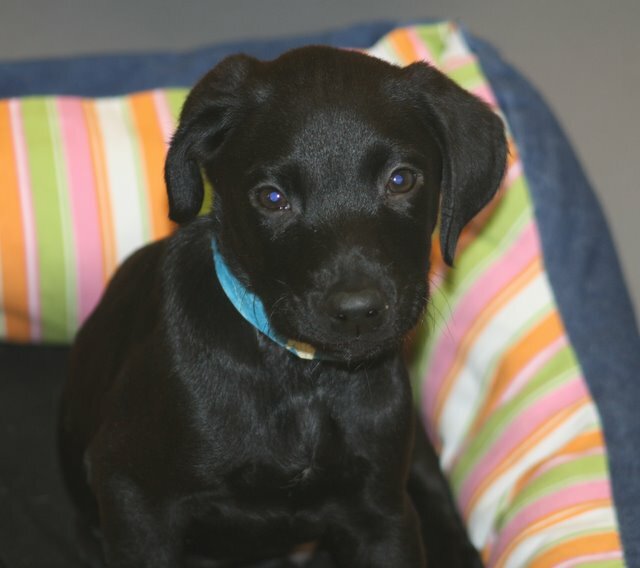 Happily, the Jan Rees-Jones Animal Care Center response to-date is working as seen on January 2nd, the first day of operation, when 24 animals were adopted and yesterday when 35+ animals found new homes. Last year, I wrapped up our conversation with a blog about books and documentary films that inspire me. A big thanks to everyone who sent me their favorites – keep them coming. I look forward to reading your picks, and paying it forward in a future blog. To ring in 2012, I’ll begin with places that spark my creativity. 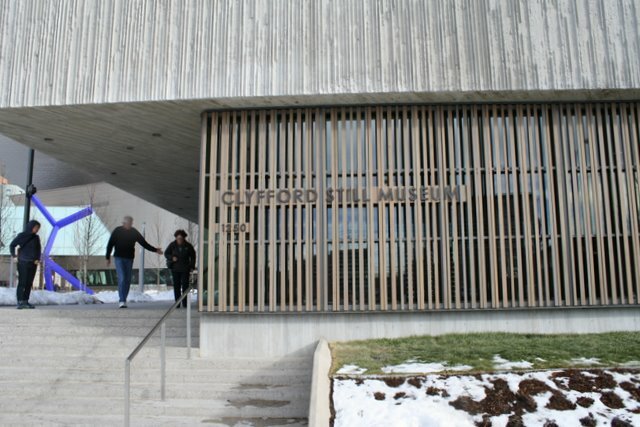 Over the holidays, I had a chance to visit the Clyfford Still Museum which recently opened in Denver, the city that was awarded this American artist’s estate. 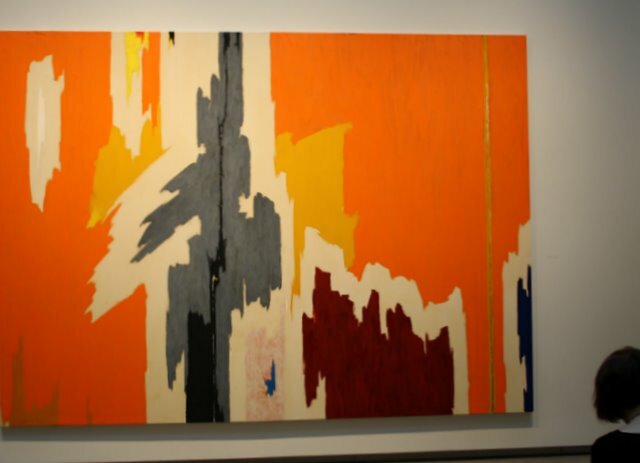 Clyfford Still’s life story and how Denver became the site for 95% of his artistic output are fascinating. His final will stipulated that his body of work – all 2,400 pieces – had to be housed in one place and only in an America city. Still did not want his work lost in a museum’s vast, encyclopedic collection or owned on foreign soil. The 50-years of work, from his early figurative pieces to his later large-scale abstract paintings, landed in Denver after a distant relative (a Denver resident) suggested to Still’s widow that she consider Denver as the “American city.” She did, and the rest is history. Still’s story is even more interesting. At a highpoint in his career, he got sick of the public scrutiny of his work and decided to leave New York – where he was one of the central figures along with the likes of Jackson Pollock, Mark Rothko, Clement Greenberg – and move to a quiet farm in Maryland. He intentionally placed himself on the periphery, where he was content to produce work for himself – 835 paintings are now in Denver’s museum. Most have never been seen by the public because once Still finished a painting, he rolled it onto a tube for storage in his barn. When the curators began taking inventory, they sometimes found 11 paintings on one tube! In his own words, Still said that “behind all my paintings is the figure.” The current show is clearly curated for you see that every composition uses a vertical line format from his earlier figurative work (1930’s – 1940’s) to his later abstractions of standing bodies (1940’s until his death in 1980). The architect Brad Cloepfil and his team at Allied Works designed this museum. Their body of work is another source of inspiration for me. I first became aware of their work when they won a Dallas competition to renovate and expand Booker T. Washington High School of the Performing and Visual Arts, Dallas’ Arts Magnet School for talented kids. I met Brad at a book signing, and he talked about the Denver commission, his excitement about the museum project and the Winter 2011 opening. Both the Still Museum and Booker T. buildings are thoughtfully designed to honor the occupants, their work and stories without distractions. I stumbled across another artist who is inspired by Still’s paintings and colors. 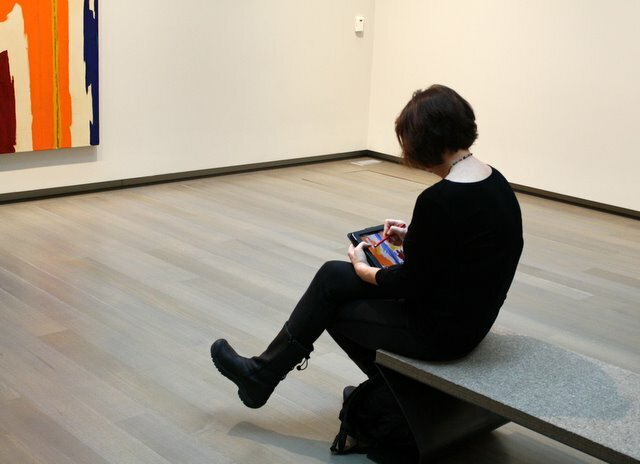 Note her iPad and paint program. Happy 2012: Wishing you a year of creativity (whatever your field) and visiting inspiring places.